We have talked about emergency preparedness a lot on our site lately. We believe in kitchen self-sufficiency and traditional skills because they are healthy, economical, environmentally friendlier than packaged foods, and…because they ensure a greater sense of security in the face of disaster. Disaster preparedness is on our minds this time of year, knowing that we are just around the corner from Tornado Season and Hurricane Season in many parts of our country. 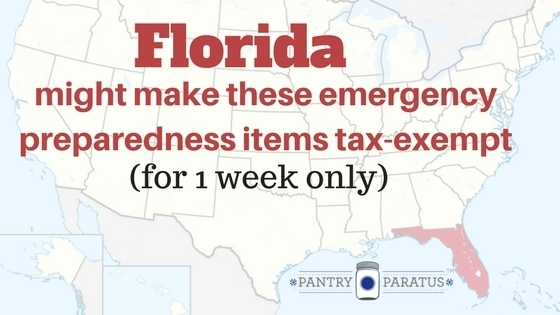 The state of Florida has heard bills for several sessions in a row to encourage people to be prepared for natural disasters, and have approved tax-exempt weeks for over a decade to help citizens get ready. The state recognizes that it is in their best interest and the best interest of its fine citizens to be ready for what may come. If you don’t live in Florida but have family or friends that do, be intentional and ask them if they are ready for the Spring storms. If you live in a state with something like this that I don’t know about, would you leave a comment? 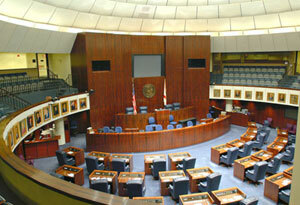 Florida routinely passes a bill through their legislature (right now it’s Bill 664, first read on the floor 2/16/2017), which makes many preparedness disaster items tax exempt! The catch is that this tax exemption would be good for only 1 week (the start of Hurricane Season). May 30-June 5th in 2017, you could prepare for what may come and save a few pennies, too. This is still yet to pass, so keep an eye on your government! I found it somewhat humorous that they had to specify in this law that sales in hotels and theme parks don’t count. The bill is called the Disaster Preparedness Tax Exemption Bill, so watch to see if this will take effect and help you save a few dollars. Find the bill here for the details.